I hope to be back tomorrow. I have some projects from this past weekend's Stampin' Up! regional in San Antonio. 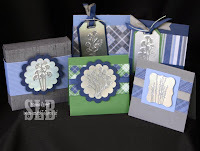 I also have some projects from my upcoming Holiday Giftables class to show off. I'm really excited about this class! These are beautiful! I'm gonna have to try this with this stamp set. Thanks for the great ideas.